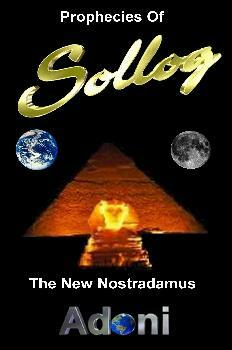 Sollog is world famous for his Prophecies that have amazed his legion of fans around the world for over 20 years. He is considered by many to be the Greatest Prophet in History. He has authored over 100 books and given humanity many new laws of math and astrophysics. Due to his amazing ability to astral travel and bring back details about the future as well as new laws in math, physics and astrophysics. In the Summer of 2016 The Prophecy Songs of Sollog were released and the had over 30 Million Plays on SoundCloud that summer. Sollog says he came to Earth to prepare humanity for the impending asteroid strike that kills 99.9% of humanity. Those who survive are those that move to the Sollog Safe Zones. Sollog is world famous for his Prophecies that have amazed his legion of fans around the world for over 20 years. He has authored over 100 books and given humanity many new laws of math and astrophysics due to his amazing ability to astral travel and bring back details about the future as well as news laws in math, physics and astrophysics. Sollog’s Prophecies have foretold many events and he was the first person to predict the connection in many major loss of life events would occur over and over on Solstice Lines connected to dates and location he gave in his Prophecies. For over 20 years Sollog has been amazing the world of Academia with his new theories in math, physics and astrophysics. The Sollog Creator Formula – Sollog unified the major religions creation myths to a scientific proof for the earths circumference. Sollog 30 Mod Prime Theory aka Adoni Prime Spirals – Sollog shocked the world of academia releasing an algorithm for where every prime number is located and destroyed the false math theory that primes were random. This theory was used by the NSA to backdoor all modern encryption using large prime factors. Sollog PDF Planetary Distance Formula – Sollog corrected the first major law in physics that grew out of fashion over a hundred years ago proving Titius Bodes was indeed part of a design to our solar systems creation. Sollog HelixQ – A 10 Dimensional Math and Computer Language created by Sollog that will eventually be the Operating System for AI (Artificial Intelligence) Computers that will be able to create 10 Dimensional Virtual Space. Sollog EOE Theory (Elliptical Orbit Effect) – Sollog’s astrophysics theory that proves life is abundant in the Universe and how plate tectonics is controlled by Solstice Line Energy from EOE.